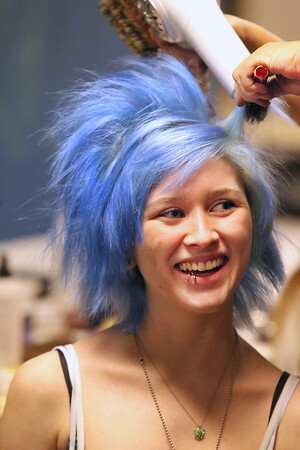 Chelsey Rogers has her hair done by Kate Savage for Saturday's 6th Annual Trashion Fashion Show at Traverse City West. The featured student-designed and modeled fashion made from recycled and reused materials, with proceeds going to Pete's Place youth shelter. Rogers dyed her hair blue for the event, it was blonde, and naturally it's brunette. "I haven't seen it in two or three years," she said.